← Review of my book in Optics & Photonics News! Today, August 27th, marks the grim anniversary of one of the most devastating volcanic eruptions in recorded history: the final explosion of the island of Krakatoa in 1883. The eruption — and the tsunami that was generated by it — is estimated to have killed some one hundred thousand people, and it has even been speculated in Simon Winchester’s 2003 book Krakatoa: The Day the World Exploded that the eruption led to the political downfall of the Dutch Indonesian colonies. 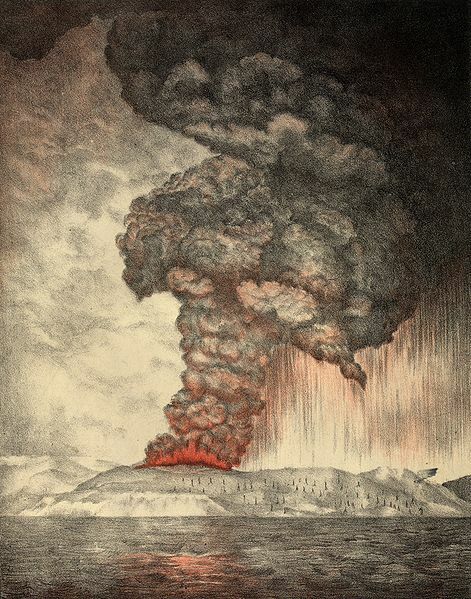 An 1888 lithograph representing the eruption of Krakatoa (source). On his Scientific American blog History of Geology, David Bressan has relayed some of the eyewitness accounts of the devastation. I thought it would be interesting to describe some of the first published scientific accounts of the event, and the struggle to understand it in its aftermath. THE details which have reached us during the past week, of the terrible seismical manifestation at Java, prove it to be one of the most disastrous on record. Probably, moreover, it is the greatest phenomenon in physical geography which has occurred during at least the historical period, in the same space of time. The accompanying sketch-map will afford some idea of the extent and nature of the change which has taken place, and the character of the seabed and land in the region affected. The attached figure is as shown below, and apparently indicates how much the actual height of the land and sea-bed changed as a result of the upheaval! The volcanic island of Krakatoa lies about the middle of the north part of the passage between Java and Sumatra, a passage which has formed an important commercial route. The strait is about seventy miles long and sixty broad at the south-west end, narrowing to thirteen miles at the north-east end. The island, seven miles long by five broad, lay about thirty miles from the coast of Java; and northwards the strait contracts like a funnel, the two coasts in that direction approaching very near to each other. A few weeks ago, as we intimated at the time, the volcano on the island began to manifest renewed activity. The whole region is volcanic; Java itself having at least sixteen active volcanoes, while many others can only be regarded as quiescent, not extinct. Various parts of the island have been frequently devastated by volcanic outbursts, one of the most disastrous of these having proceeded from a volcano which was regarded as having been long extinct. The volcano in fact showed seismic activity for several years before the final eruption; steam began venting from the northernmost cone of the mountain beginning in May of 1883. The present outburst in Krakatoa seems to have reached a crisis on the night of Aug. 26. Tlle detonations were heard as far as Soerakarta; and ashes fell at Cheribon, about 250 miles eastwards on the north coast of Java. The whole sky over western Java was darkened with ashes; and, when investigation became possible, it was found that the most wide-spread disaster had occurred. The greater part of the district of North Bantam has been destroyed, partly by the ashes which fell, and partly by an enormous wave generated by the wide-spread volcanic disturbance in the bed of the strait. The town of Anjer, and other towns on the coast, have been overwhlelmed and swept away; and the loss, of life is estimated at 100,000. The island of Krakatoa itself, estimated to contain 8,000,000,000 cubic yards of material, seems to have been shattered, and sunk beneath the waters; while sixteen volcanic craters have appeared above the sea between the site of that island and Sibisi Island, where the sea is comparatively shallow. The Soengepan volcano has split into five; and it is stated that an extensive plain of ‘volcanic stone’ has been formed in the sea, near Lampong, Sumatra, probably at a part of the coast dotted with small islands. A vessel near the site of the eruption had its deck covered with ashes eighteen inches deep, and passed masses of pumice-stone seven feet in depth. The wave reached the coast of Java on the morning of the 27th, and, thirty metres high, swept the coast between Merak and Tjiringin, totally destroying Anjer, Merak, and Tjiringin. Five miles of the coast of Sumatra seem to have been swept by the wave, and many lives lost. At Taujong. Priok, fifty-eight miles distant from Krakatoa, a sea seven feet and a half higher than the ordinary highest level suddenly rushed in, and overwhelmed the place. Immediately afterwards it as suddenly sank ten feet and a half below the high-water marks the effect being most destructive. We shall probably hear more of this wave, as doubtless it was a branch of it which made its way across the Pacific, and that with such rapidity that on the 27th it reached San Francisco harbor, and continued to come in at intervals of twenty minutes, rising to a height of one foot for several days. It is misleading to speak of such waves as tidal: they are evidently due to powerful, extensive, and sudden disturbances of the ocean-bed, and are frequently felt in the Pacific when no earthquake has been experienced anywhere, though doubtless due to commotions somewhere in the depths of ocean. So far, these are all the facts that are known in connection with this last stupendous outburst of volcanic energy. It has altered the entire physical geography of the region, and the condition of the ocean-bed. The existing charts of the strait, with their careful soundings, are useless forpurposes of navigation; and, when quiescence is restored, a new series of soundings will be necessary. Doubtless the results of the outbreak will receive minute attention at the hands of the Dutch government; and, when all the data are collected, they will form valuable material for the study of the physical geographer. The council of the Royal society has appointed a committee for the purpose of collecting the various accounts of the volcanic eruption at Krakatoa, and attendant phenomena, in such forIn as shall best provide for their preservation, and promote their usefulness. The committee invite the communication of authenticated facts respecting the fall of pumice and of dust, the position and extent of floating pumice, tile date of exceptional quantities of pumice reaching various shores, observations of unusual disturbances of barometric pressure and of sea-level, the presence of sulphurous vapors, the distances at which the explosionls were heard, and exceptional effects of light and color in the atmosphere. The committee will be glad to receive, also, copies of published papers, articles and letters, bearing upon the subject. Correspondents are requested to be very particular in giving the date, exact time (stating whether Greenwich or local), and position whence all recorded facts were observed. The greatest practicable precision in all these respects is essential. Capt. A. W. Newell, of the bark Amy Turner of Boston, has brought in some pumice which was washed aboard his vessel, Sept. 17, 1883, in latitude 7° 25′ south, longitude 103° 21′ east, about a hundred and sixty-five miles south-west from Krakatoa, Sunda Straits. It covered the sea in windrows, and was observed as fine ashes as far distant as thirteen hundred and fifty miles from its source. Another effect of the great eruption of Mount Krakatoa has been recently noticed. It was followed by a series of barometric waves which seem to have spread almost over the entire world. Professor Förster of Berlin says, The great eruption in the Straits of Sunda, which happened on the morning of Aug. 27, gave rise to an atmospheric wave which showed itself for five or six days in the records of the self-registering barometers in all parts of the world. In the barometric markings which are registered by the Commission of weights and measures in Berlin, in order to have a permanent record of the minuter variations, these effects of the volcanic eruption appear with striking clearness. The first atmospheric wave from this source appeared in Berlin about ten hours after the catastrophe. Supposing it to have taken the shortest course from its origin to Berlin, this time would inldicate a speed of somewhat more than a thousand kilometres per hour, agreeing very closely with the velocity of sound. This result is in complete accord with barometric records in other parts of the world. About sixteen hours afterward a second and entirely similar barometric wave appeared, which, however, is to be considered as the arrival of the same wave by the longer circuit over America and Europe. 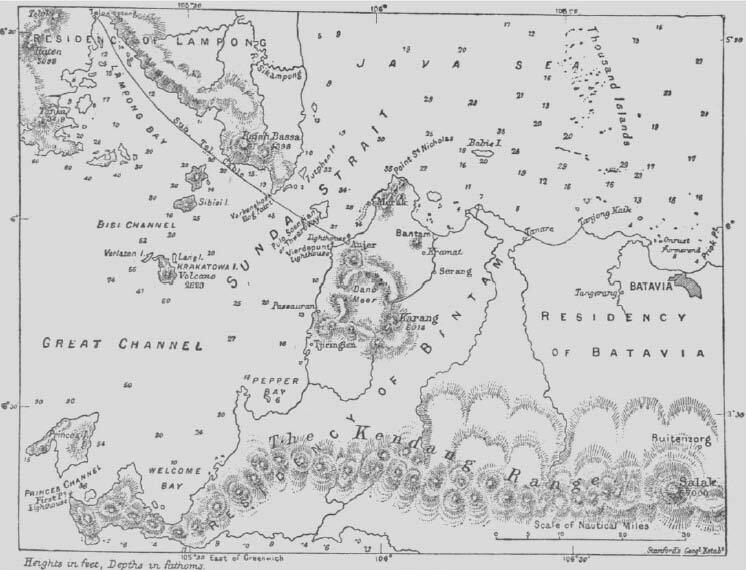 In fact, if we take the difference of the two courses, -the one from the Straits of Sunda to Berlin over the East Indies, and the other over America,- we shall find that to the above velocity of propagation corresponds the delay of sixteen hours in the arrival of the wave by the American route. It thus appears that the entire wave completed the circuit of the earth in a time which must have amounted to thirty-six hours. In fact, thirty-six hours later there did appear in Berlin, in a direction from the East Indies, another perceptible wave corresponding closely to the first one, but somewhat diminished in strength. The corresponding return from America took place in a period of some thirty-four or thirty-five hours. This is brought into agreement with the other period by the consideration that the atmosphere in general has a motion from west to east. A third wave was recognized after an interval of thirty-seven hours from this time. The diminishing strength of the waves prevented the returns of the single waves from being accurately followed, but small variations of an unusual kind are seen in the record until the 4th of September. We can therefore be satisfied that the atmospheric waves caused by the volcanic eruption were powerful enough to make the entire circuit of the earth three or four times, and that in the beginning the variations of pressure amounted to one five-hundredth of the entire atmospheric pressure. 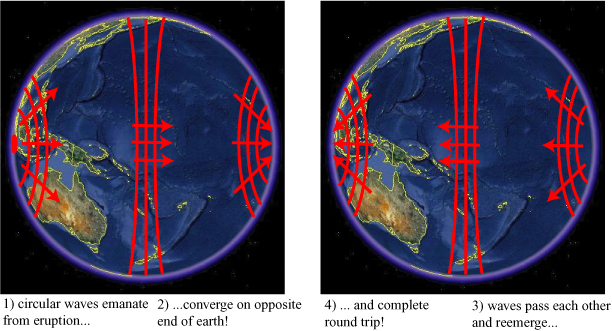 You published, in May, a couple of interesting communications on atmospheric waves from Krakatoa. As the effect through the water was still more marked and more sharply defined at very great distances, I have made for publication, by authority of the superintendent of the U. S. coast and geodetic survey, reduced photographic copies of the records of the self-registering tidegauges at Kadiak, Alaska, and at Saucelito, near San Francisco. These copies cover the period from 0h. Aug. 27, to 0h. Aug. 30, or the seventy-two hours during which the tide-gauges show, in a very marked manner, the effect of the Krakatoa earthquake upon the masses of water in the North Pacific Ocean. It is interesting to notice that the impact of the earthquake was apparently felt earlier and in a greater degree at San Francisco than at Kadiak; although the former is 1,473 geographical miles more distant, in a direct line, from Krakatoa. These figures are presented below; the overall oscillation is the rise and fall of the tides, while the jagged lines, especially starting at 14:00 on August 27th, represent the variations due to the tsunami remnants. The eruption of Krakatoa was ironically a great tragedy and a wealth of information for science. Never before had an eruption of that power and devastation been exposed to scientific scrutiny, and not since — yet. A least one dubious theory has given Krakatoa credit for more than scientific inspiration. It is well-known that the debris thrown into the sky by the eruption created vivid, blood-red sunsets in Europe for months in 1883 and 1884. 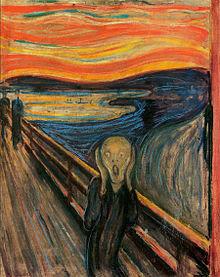 In 2003, astronomers suggested that those unnatural sunsets were the inspiration for the background in Edvard Munch’s classic 1893 painting The Scream! * “The Java Upheaval”, Science, Vol. 2, No. 35 (Oct. 5, 1883), pp. 469-470. ** G. J. Symons, “The Krakatoa Eruption”, Science, Vol. 3, No. 56 (Feb. 29, 1884), p. 244. *** C. O. Boutelle, “Water-Waves from Krakatoa”, Science, Vol. 3, No. 73 (Jun. 27, 1884), p. 777. Thanks for an info-packed post. I read Winchester’s book, which completely fascinated me–I’m not remotely qualified to comment on the geosciences in it–and have been interested in all things Krakatoa since. Difficult to wrap my mind around the enormity of it and of the devastation. Thanks, and you’re welcome! Though a horrible catastrophe, Krakatoa was also one of the most fascinating geological events in recorded history. I’ve been fascinated and obsessed with it for years, myself! Actually, I’m well aware of the naming convention. However, considering all of the historical documents I quote use “Krakatoa”, it was easiest to use this spelling.